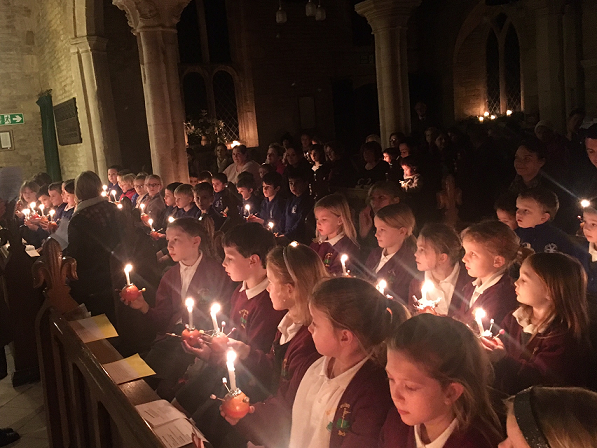 The Christingle service was celebrated again this year at a full St Peter's Church at Wymondham, led by pupils from both Wymondham St Peter's and Croxton Kerrial Schools. Prayers were said and songs and hymns sung to the organ accompaniment of St Peter's School music teacher, Mr Peter Nelmes. Excitement was aroused in both children and adults when the Christingle oranges were lit. An extra special Christian family atmosphere was obtained for a few magic moments when the lights were switched off and the church was only illuminated by the flickering lights of the burning candles.